Get the big picture of what is happening to some of the UK's key bird species in the BirdTrends report. Drawing on data from a number of schemes including the Breeding Bird Survey, Nest Record Scheme and Ringing Scheme, this annual report reveals which species are decreasing in numbers, which are booming and how breeding succes is changing over time. 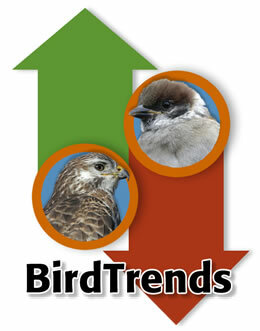 BirdTrends now includes trends across habitats. BirdFacts gives in depth information about all of the 580 species recorded in the wild in Britain. For each bird, BirdFacts provides details of Population and Distribution, Breeding and Survival and Biometrics, along with other fascinating facts. Browse our expanding collection of bird ID workshops on tricky species. To learn more about bird identification, try one of our training courses.